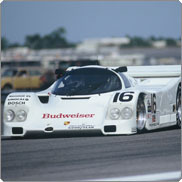 The team had a new 962 at the first race of the season in 1990, the Daytona 24 Hours. Team members called it "Box Stock Betty" because Porsche insisted they run it without any modifications. But the team realized the car needed more downforce and bypassed the dictates of the factory and redid the bodywork. Weaver was third in the next race at Miami with Scott Pruett, and ended the season with another podium at Watkins Glen and a win at Tampa. James was sixth in drivers points, driving the only Porsche in the top ten. James ran ten races in the Porsche in 1991, with his best finish being a fourth at Miami. The team had sold the car in 1992, but borrowed it to race the 24 Hours of Daytona at the beginning of 1993, and finished second in GTP. It was the only sports car race they ran that year and moved over to an Indy Lights effort for James Weaver the reminder of the year. Rob Dyson: "I remember that stock Porsche 962 we ran at Daytona in 1990. It had a small dinosaur painted next to my driver's name: I was the last of the owner-drivers, hence the dinosaur. "At the peak of the GTP era, we had three 962 chassis. We also ran the radical tailed DR2 variant of the 962. It was a Nigel Stroud design for Richard Loyd. It had a rising-rate front suspension. We put a lot of work into it but it didn't work very well on our American tracks. Our tracks were too rough. The suspension was a little tighter and it just didn't work right. We won a bunch of races with it, but it was not the leap forward we thought it would be. "Because of this and the fact it was an air cooled car, we sold the DR2. We bought chassis number 148, the last all Weissach-built 962. After that, any of the ones after 148 were built by Fabcar (David Klym) under a contract with Porsche. We ran the 148 which was a Group C car, and put it into IMSA trim."